Known for their quality, durability and reliability, SamcoSport continues to offer exceptional, cutting edge products. Each product is designed and developed by an in-house team of engineers who use only original factory parts as guides to ensure optimum design accuracy and product fitment. Replacing standard OEM hoses results in increased performance and a better looking bike. Multipart components are re-designed by SamcoSport to be replaced by single piece hose, minimizing potential leak points and improving flow efficiency through the use of Samco® Zero Block Tooling. 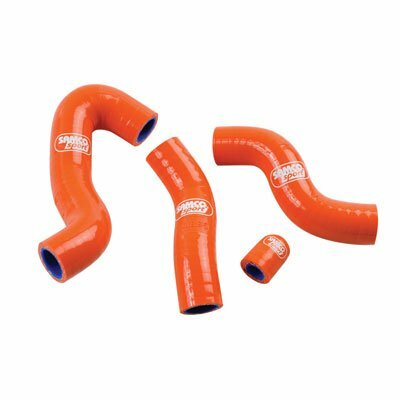 SamcoSport hoses weigh less than standard OEM hoses and are more durable, providing better debris & crash resistance, perfect for your off-road needs. The sign of quality. More teams trust SamcoSport products than any other brand. SamcoSport only use the highest quality automotive grade European silicones. SamcoSport have developed various liners for applications such as coolant, air, oil and fuel. Using multiple layers adds strength to the hose and precision building minimizes overlaps. If you have any questions about this product by SamcoSport, contact us by completing and submitting the form below. If you are looking for a specif part number, please include it with your message.